Yesterday, we had a bit of precipitation. Ice. A bit of snow. And generally a grrreat day for sleeping. Who wants to slip and slide whilst doing his business? I ask you! The sidewalks were too slippery to walk on, so We walked on the grass. The blades were frozen and stuck in my paw pads. Ouch. So, here I am back in the big bed. Snoozing like a human. Do you sleep like a person? Maybe, it’s people who sleep like us anipals. Yeah. That’s it. 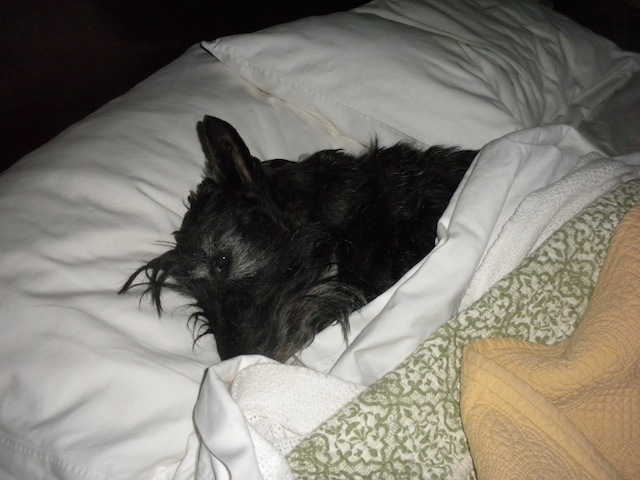 This entry was posted in dogs with blogs, Scottish Terriers, Terriers, The Scottie Chronicles and tagged dog habits, dogs, habits of dogs, life, pets, Scotties. Bookmark the permalink. 53 Responses to Do You Sleep Like a Human? I’ve done that, too! It’s fun. And scares the peeps when I head under the covers. I’VE SLEPT ON A TABLE TOO! Great Scotties act alike. That is SO FUNNY. We were just barking about that. I’ve done that, too! YES! Pippen sleeps like a human sometimes! I love it, always makes me smile!! Yes I dos…makes the peeps laff! Do your peeps laff at you as well? Yes, they certainly do laff. I hope it’s with me not at me, though. We sleep where ever we want! Expect the living room sofa and chairs…..well, only there when we can get away with it. Banks will sleep and sleep and sleep alllll day. Not me, I have chippers in the back yard to keep on their toes!! Hope you are staying warm, Stuart…. I think I could sleep all day long too! Well I sleep curled up with my nose in my bum ~ that would be difficult for my Lee to achieve. BWAAAAAHAAAAAAA! So nice to hear from you Sweet William. And such a funny comment! I have a little nest in the middle of the bed and I sleep on my head so my eye brows go back and not down. My peep has to sleep with diagonal in the bed. I need to figure this out….. I’m trying to picture it. The diagonal part, I get. OH….I see now. My eyebrows got in the way. Kali sleeps next to Him or on His legs like Kyla did. Kaci either sleeps on a pillow or next to Him. Most of the year you don’t need blankets. And where do you sleep, my fine feathered friend? You won’t believe this but in a Coca-Cola cardboard box on the bottom of my cage. They have to give me a new one every few days because I shred them. I’d believe anything. I can see you in the box. Right now. Coca Cola is the best anyway. You look comfy, I think I need a nap!! It’s a good day for a nappy noodle! Yep. Sure do! The peeps are lucky if they even get a spot in the bed! I kick mine out of the bed sometimes myself! You know know, I have a double coat, too. I don’t know how I stand it. LOLLLLLLLLLL. Egyptian sheets! Me tooOOOOOOOOO! We’re kings. You need some poppies. Like Dorothy in the Wizard of Oz. I bet you all snore. Yep, the bed is ours, but we do let THEM have a slice of it! Sometimes you’ve got to. Right? We all sleep with the Peeps; Elsa at the top between their 2 pillows, Andy is down by HIS legs and me, I’m a Momma’s boy, curled up by HER side. We love to sleep on our, errrrr their bed. ZZZZZZZZ……..
We have a hard time fitting in Our bed and it’s just the three of us! I’m not much for the covers, but I do like a nice soft pillow under my head preferably next to my Peep! She piles on the blankets because she doesn’t have fur like me! Mine does too! Poor thing. Aaahhhh….it doesn’t get much better than that does it? I does when it’s cold. Sounds like that was the best place to be! Oh yes! Snuggly. So I can leave sticks and stuff from my furs in Their bed. Tee Hee. I certainly do sleep like a human. Mama has lots of photos of me doing this. I get to sleep not he big bed every night – sometimes wrapped around Mama’s head like a hat! None of us do, but you sure do look darn cute Stuart!